The use of harmonica in blues music owes a big debt to Big Walter Horton, who helped define the harp sound that we still hear today. 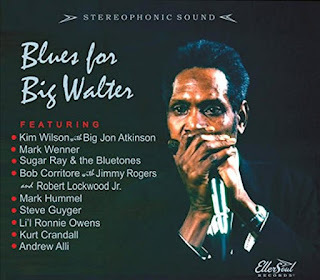 Big Walter passed on back in 1981, which was way too soon, and to honor him and his contributions, Li’l Ronnie Owens (also no slouch on the harmonica) put together a cool tribute disc that includes nine harp players running down sixteen cool tracks. There is a little bit of everything on Blues for Big Walter, and recording took place on two continents over the course of three decades. Besides Owens, on this production you will hear Kim Wilson, Mark Hummel, Bob Corritore, Sugar Ray Norcia, Steve Guyger, Mark Wenner, Kurt Crandall, and Andrew Alli. Each of these guys has a great sense of history and incredible talent, making this a very special project. As an added bonus, backing them are dozens of incredible musicians, including Anthony Geraci, Bob Welsh, Robert Lockwood Jr., Big Jon Atkinson, and many more. This was a labor of love, as the artists performed for free, and proceeds of sale go towards two fine blues charities: The Blues Foundation and the Handy Artists Relief Fund (H.A.R.T). 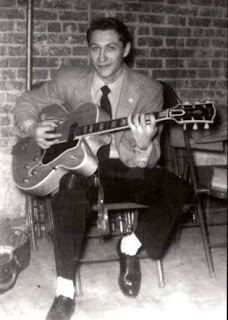 ”She Loves Another Man” showcases the hard-working Bob Corritore on harmonica and the late Jimmy Rogers on vocals and guitar. This is Chicago blues at its finest, and Bob’s understated harmonica work fits in perfectly. His phrasing and sense of space complement this song perfectly, which is what Hornton brought to the projects he worked on. Big Walter was the ultimate sideman! ”Sugar Ray Medley” is the showpiece of “Blues for Big Walter,” an 18-minute track that includes “That Ain’t It,” “Walter’s Boogie,” “Everybody’s Fishing,” “I Don't Get Around Much,” and “Blueberry Hill.” A lot of thought and practice went into this medley, as the individual songs blend seamlessly into each other and have an amazing balance. And, of course, Sugar Ray Norcia nails the vocals and harp parts; he is simply a joy to listen to. Finally, the album closes up with ”Think Big,” a live version that was cut by Li’l Ronnie with Terry Garland on guitar in at the Canal Club back in 2009. Owen’s harp is crystal clear and takes a nice leading role over Garland’s acoustic guitar. It is cool to finish up with a bare-bones instrumental that features the harmonica up front for this very special compilation. 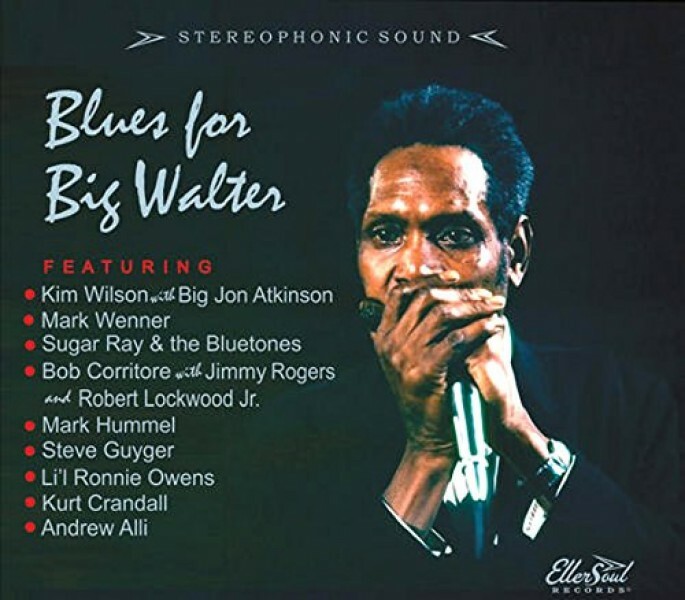 If you are a fan of blues harmonica or Chicago style blues, Blues for Big Walter is a must buy. Rumor has it that there were many more artists that were interested in participating, but there just was not enough room on the disc (it comes in at 75 minutes), so there might be a volume 2 coming up. So, keep your fingers crossed and check in with the Ellersoul website for updates. I was in a jam before a long flight as my headphones had broken and I needed to pick up something cheap so I could listen to my music (and write a few more reviews). 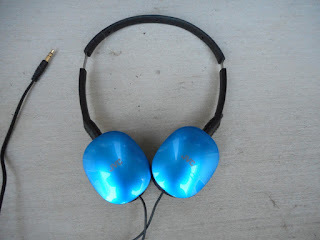 So, at the electronics store near my hotel I grabbed a pair of JVC HA-S160-AA compact headphones out of the bargain bin. For 1,360 Yen (about 13 bucks), how could I go wrong? For starters, the phones came in one of those plastic capsules that in the United States are nearly impossible to get into without a knife. Apparently there are not the same security concerns in Japan, as it was simply folded together instead of being melted together. So, things got off to a good start! 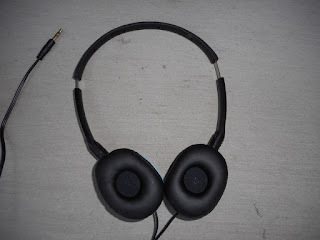 These are compact headphones that fold flat and take up very little space. To make them this flat, they are on-ear headphones, and as such they do not weigh very much, only 66 grams (a little under 2.5 ounces). I did not have any problems with the stainless headband snagging my hair, and there was not much tension so they are comfortable to wear for extended periods. The cord is long enough for portable device use (1.2 meters, or 4 feet), but would not be good for many other applications. It was surprising to see a doubled cord as most everything I see now has a single cord. It has an 1/8-inch jack (3.5mm), and no ¼-inch adapter is included. With no burn-in period I put these cans to use immediately for a 3 hour train ride and a 10-hour flight. 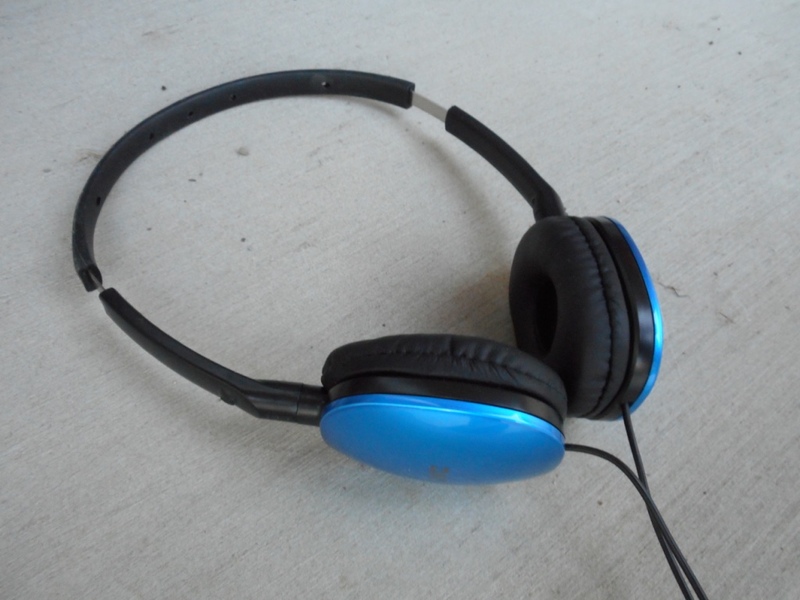 They were used with both my MacBook Pro and an iPod Nano, and with 32 ohms of resistance they were plenty loud enough to overcome all of the vehicle noise that was encountered (spec is 103dB / 1mW). 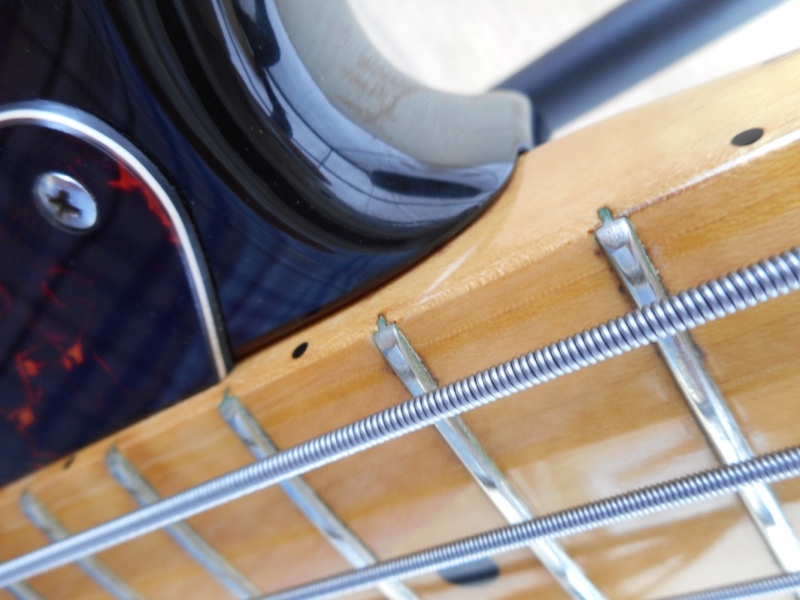 Frequency response is ambitiously listed as 12Hz to 24kHz, and maybe in a sound chamber somewhere they can provide that much bass, but they were sadly lacking when playing the blues and rock music I usually listen to – more on this in a minute. For hip-hop and rap they would most definitely be terrible. Today we are looking at a nice La Patrie Etude model classical-style acoustic guitar that I picked up at my local flea market. La Patrie is an offshoot of the Godin family of guitars and their instruments are made in LaPatrie Quebec. I think Canada may have more luthiers than lumberjacks. Maybe. 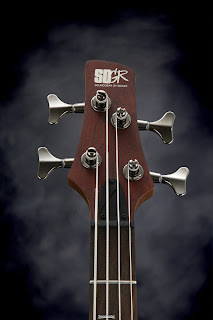 I have owned a few of their instruments in the past, and came away mostly impressed with what they have to offer. 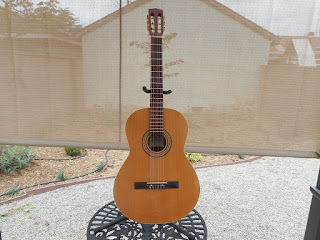 When I first picked up this guitar, I was impressed by the sound and, and even more by the seller’s asking price, which was right about as low as you can for any new guitar, and it is certainly more playable than many entry level instruments. The condition was good with no cracks or repairs, no fret wear, and some scratches on the top from exuberant playing. It also came with a hard case, so it had to come home with me! 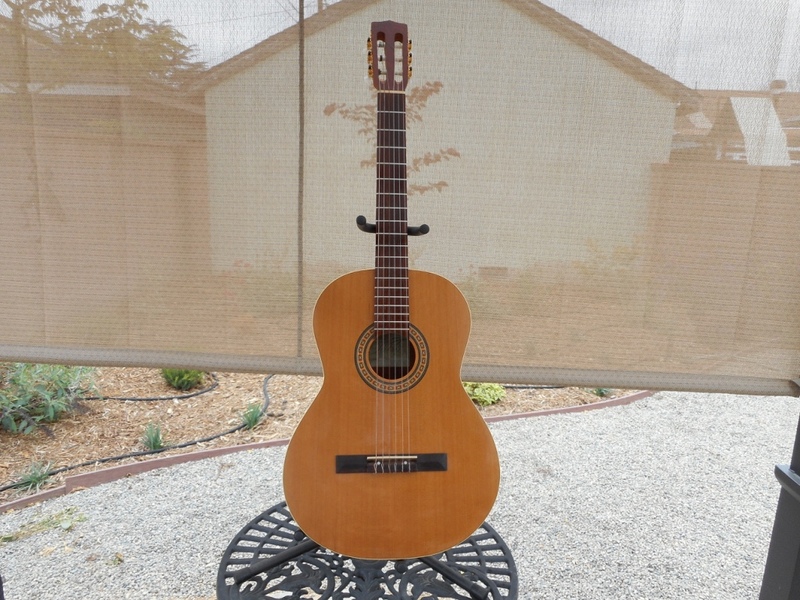 The Etude is a pleasant-looking guitar, with a solid cedar top, and wild cherry (play that funky music) back and sides, which is probably a laminate. 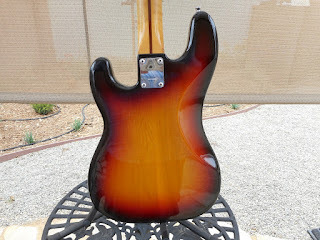 The finish is sort of a semi-gloss lacquer, and the body has a simple binding around the top and back. It is not too big, measuring 11 inches at the upper bout, 15 inches at the lower bout, and it is around 4 inches deep. 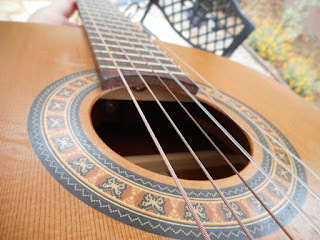 On the downside, the rosette looks a little cheap and the cedar top is very prone to scratching and dings, but it is what it is. Mahogany is used for the neck, with a rosewood fretboard and headstock front laminate, and it appears to have the same satin finish as the body. 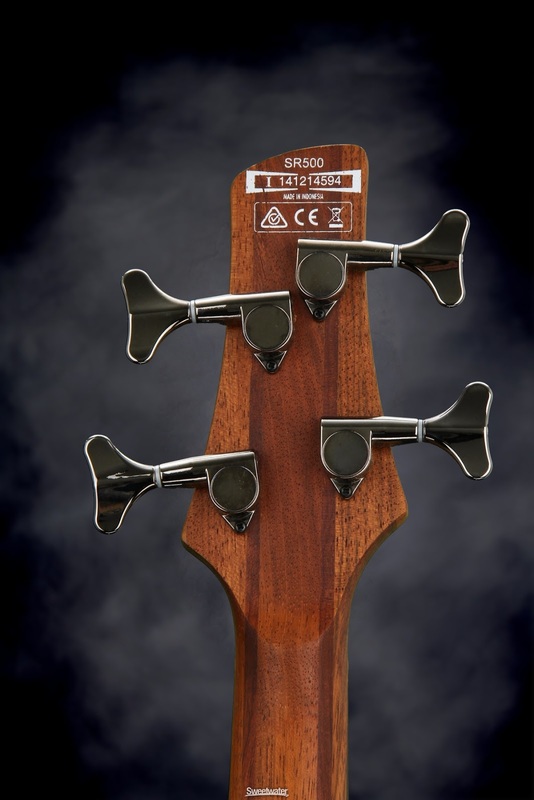 There is a dual-action trussrod in the neck (gasp! 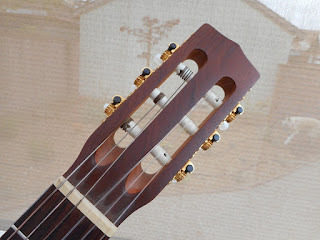 ), which allows for a little thinner profile, so it is more comfortable to me than other classical guitars, despite the standard 2-inch wide nut. 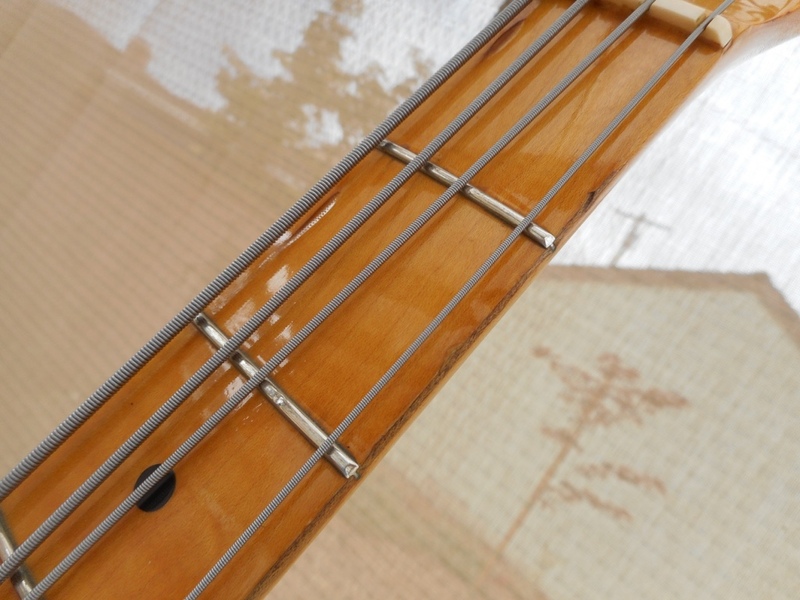 19 medium frets are sunk into the fretboard, and they are level with nice edges. For this guitar, Godin specified black and gold lyre tuners that look kind of funny, but are of barely acceptable quality and hold kind of well. 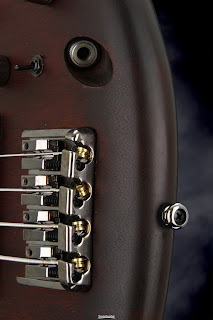 They also gave it first-rate Tusq (by Graphtech) synthetic bone nut and bridge saddles, and a rosewood bridge. Oh yes, and It is nice and light, weighing in at around 3 pounds, 9 ounces according to my scale. The seller threw in a hard case that is uglier than sin on the outside, but quite beautiful on the inside. Bonus! So, in my opinion, this Etude is a nicely made guitar with no weak points thanks to its solid materials and good craftsmanship. It sounds good and plays well with a sweet and balanced tone. It is has of impressive volume when played hard, and has a nice low-end. 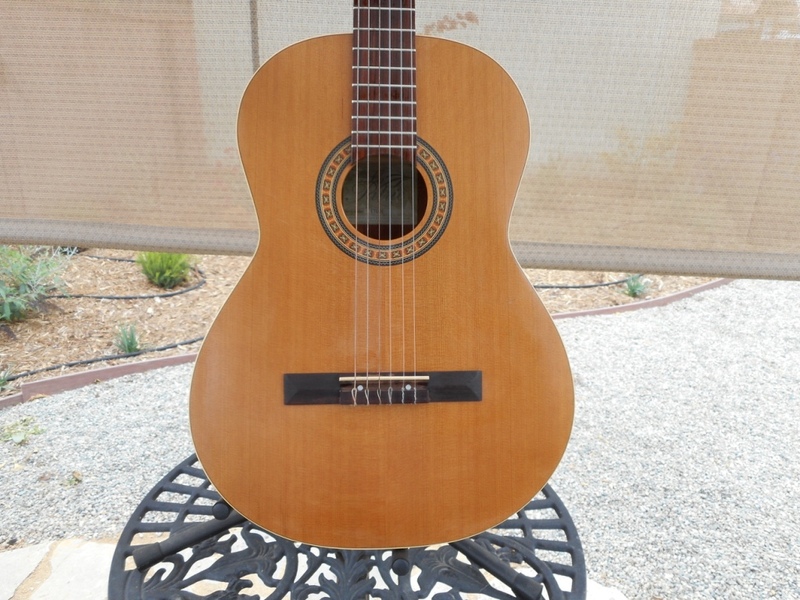 It is pleasant to play, and would be a great first guitar, which was my intention when I bought it. I usually try to keep a few nice starter guitars around to loan or sell to friends that are looking to get into playing their own music. When it come to purchasing a La Patrie Etude, used is the only way to go. MSRP on these is a $524, with a street price of about $399 (with no case), but they sell all day long on the used market for $100 to $150, often with a hard case. It is hard to go wrong for that kind of money - if you get the chance, try one out for yourself! Sometimes a new album gets misplaced on my desk, and it takes me way too long to get around to reviewing it. This happened with Eliza Neals’ Breaking and Entering, which is a damned shame as this Detroit diva really delivers the goods with this disc of hard-hitting original blues-rock. Eliza has all the right pieces for success. Her voice which is often compared to Janis Joplin, but I disagree and assert that she has found her own sound and a style that takes the phrase “high energy” to new levels. Her passion and power are so intense that it would be hard for you to find her equal. She is also an incredible songwriter who has managed to earn both the rock and blues songwriting awards from the Detroit Blues Society. 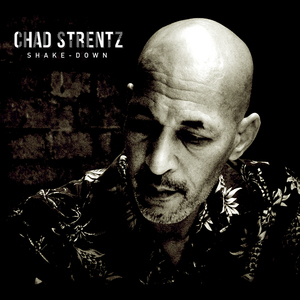 Neals wrote eleven of the twelve songs on this release, with co-writing credit for some of the tunes going out to fellow Detroit blues hero Howard Glazer, who brought his axes into the studio for this project. Eliza kicks off the set with “Detroit Drive” which features Glazer on the Dobro and Erik Maluchnik pounding out the beat on the kick drum. Neals shows a lot of versatility here as she is able to take the vocals from soft to loud at will, while maintaining an edge throughout. This basic acoustic blues provides a cool contrast with the heavy electric blues-rock that is found through much of this record. This is followed up by the title track, which is the standout song from this disc. “Breaking and Entering” is seven minutes of guitar-fueled awesomeness, and Eliza howls the lyrics with her amazing vocal skills. Paul Randolph on bass and Tim Grogan behind the drum kit hold down the backline on this 1970s AOR epic piece of pychedelia. Glazer and Neals battle it out for who gets to be in the foreground of the sonic stage, and this contest ends up as a draw. The sole cover is “Sugar Daddy,” a sweet piece of northern soul that was written by fellow Detroiter Barrett Strong. Neals pulls off a more than respectable smooth Motown sound, accompanied by backing vocals from Lizz Kristi, a heavy lead guitar from Shane Visbal, and B3 from Tyrone Smith. This song is completely different than everything else on Breaking and Entering, and it provides for an interesting break. The album finishes off with a radio edit of “Breaking and Entering” (with a more accessible 4 ½ minute run time), but the real end of the set is “Spinning.” This slowly grinding song uses Glazer’s heavily distorted guitar for the introduction then Eliza tears into the lyrics with a few layers of her distinctive voice. This bare-bones guitar and voice is really the essence of what Neals is all about – in the end it all comes down to the song, doesn't it? Breaking and Entering is a fabulous effort from Eliza Neals, as it is well-performed and there is not a bad song to be found. She brought a great group of musicians together in the studio (14 in all), and they pulled off a lot of magic with their hard work. Check it out for yourself, and do not make the mistake of misplacing this disc! 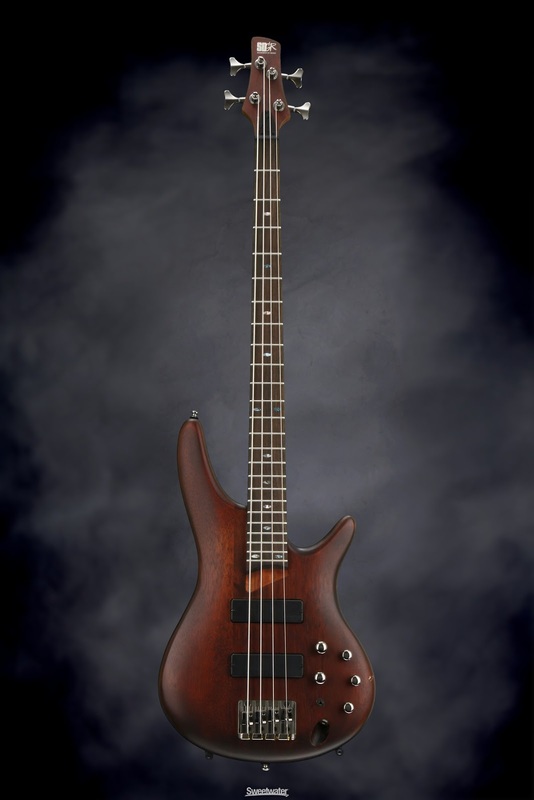 Soundgear basses have been a part of the Ibanez line-up for a long time, and I have always been taken by their appearance, which includes features like the asymmetrical headstock, oval fretboard inlays, and the carved body which its phallic upper horn. But, until now I have never had the chance to spend much time with one. 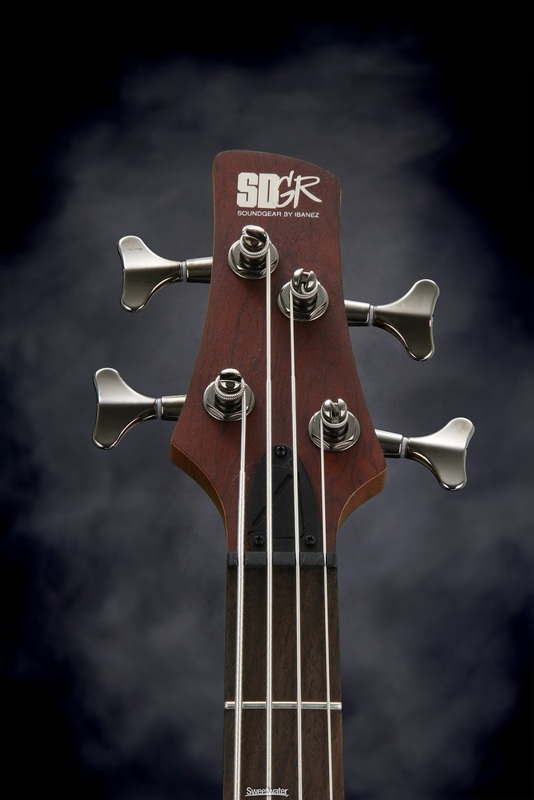 So, here are my thoughts on the SR500 Soundgear bass (model SR500BM), now that I have had the opportunity to take one for an extended test drive. 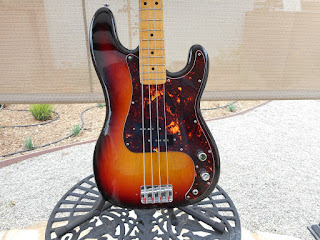 This Soundgear bass is not an entry level bass, and falls in with the crowd of lower priced basses that have a lot of features for not much dough. 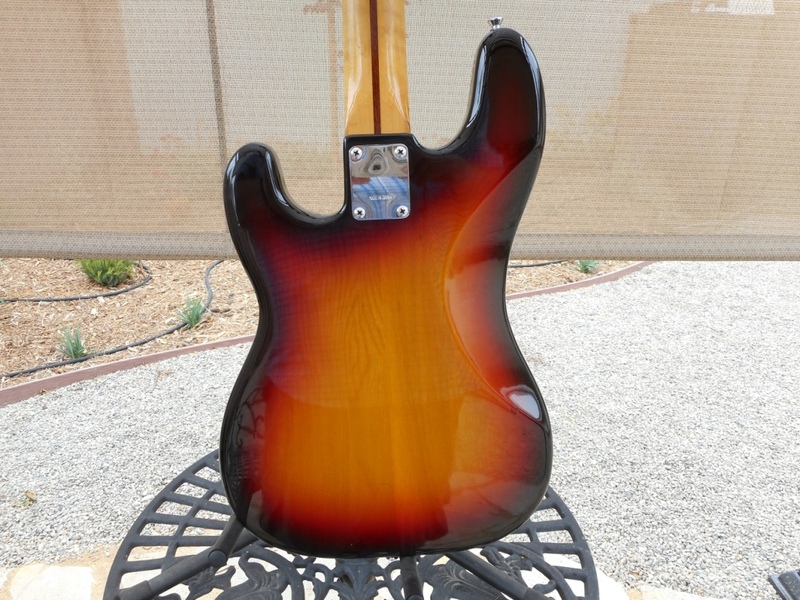 The body is made of mahogany, and it is sprayed with clear urethane finish. 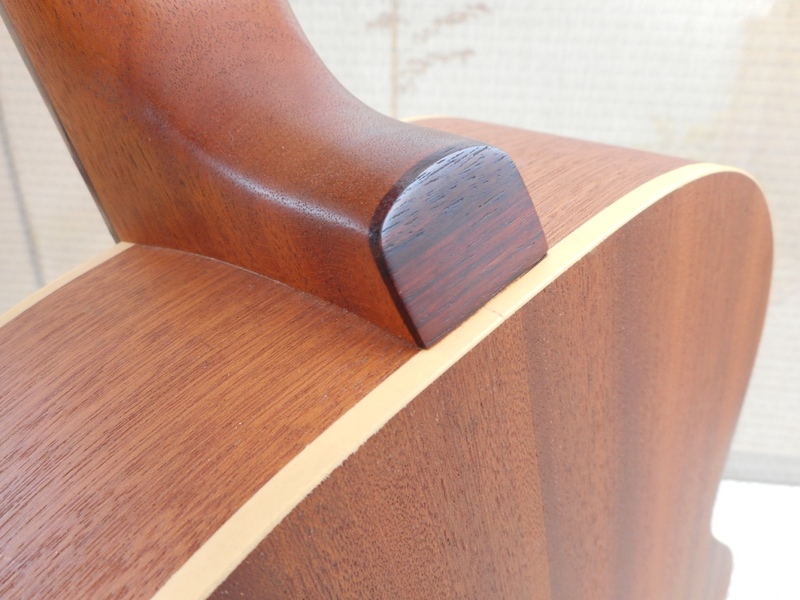 The five-piece jatoba (huh?) 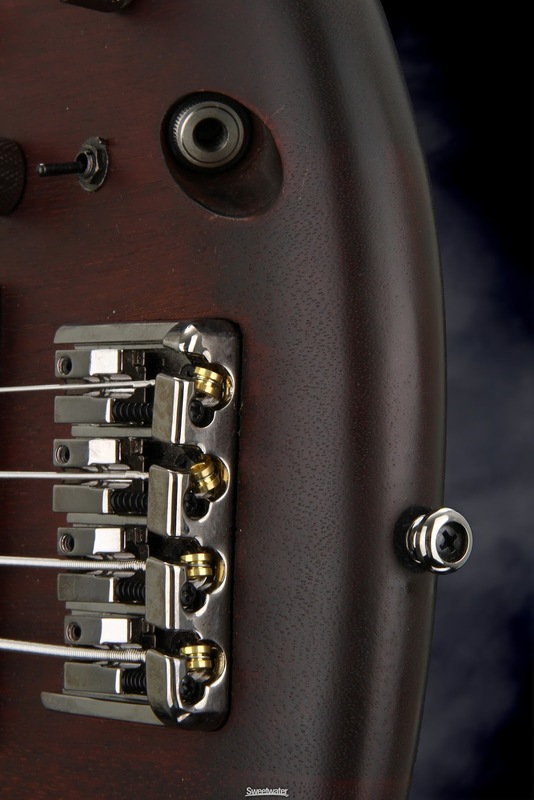 and bubinga neck has a really cool joint at the body that helps it bolt on solidly and still provide good access to the upper frets. Like anybody really plays up there. 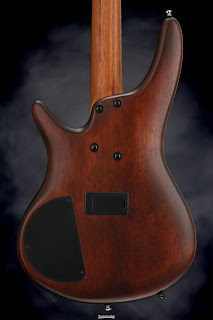 There are 24 medium frets set into the rosewood fretboard on this 34-inch scale neck, and there is a 12-inch radius and a narrow nut that is a touch under 1.5 inches. The electronics package is very good for a bass in this price range, featuring a pair of Bartolini MK1 humbuckers and a EQB-IIIS pre-amp. They are wired up through a 3-band EQ with volume and balance knobs, as well as a mid shift switch. 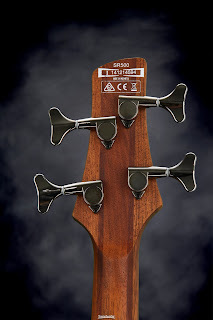 Rounding out the specs, the hardware includes a beefy bridge and sealed tuners. Ibanez had this SR500 built in Indonesia, and the folks there did a great job of putting it together. The neck joint could not be tighter, the finish is even, and the fret work is good with no sharp edges or uneven fret heights. The one I tests was new and straight out of the box, and it only took a ¼ turn of the trussrod to get the string height where I liked it, and intonation was ok, so this was one of the shortest set-ups on record. 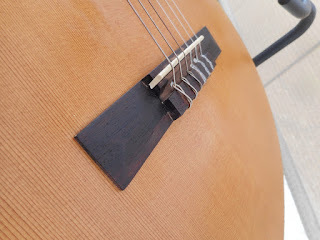 It came set up with some sort of 0.045 to 0.105 roundwound strings, which are a good match for the tone and touch of this instrument. 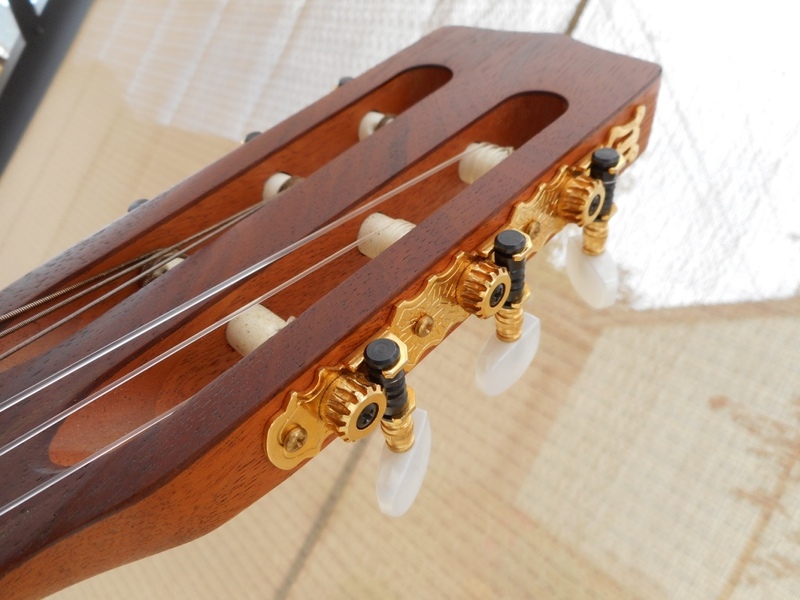 This craftsmanship combines with the materials to make for a really good instrument. This one plays very smoothly with a comfortable (and fast) neck and good ergonomics. The electronics package is versatile, and there are a lot of very usable rock, jazz, and metal tones that can be coaxed from it. It can be smooth or growly, and everywhere in between. Oh, and I left one of the best parts for last – the SR500 will not break your back by any stretch of the imagination. The bass we are looking at here weighs in at 6 pounds, 13 ounces, which is about 4 pounds less than my Les Paul. Not bad! 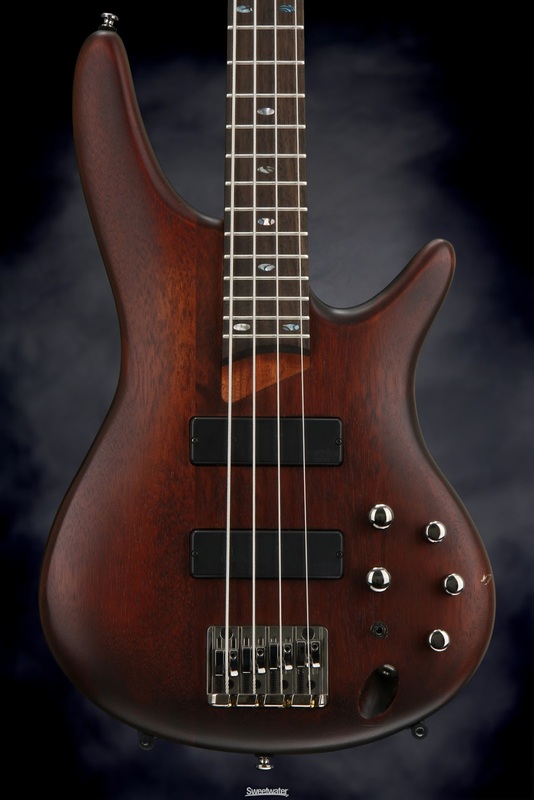 The Ibanez SR500 Soundgear Bass is a versatile instrument that plays well and sounds good, and it is not super-expensive, either. 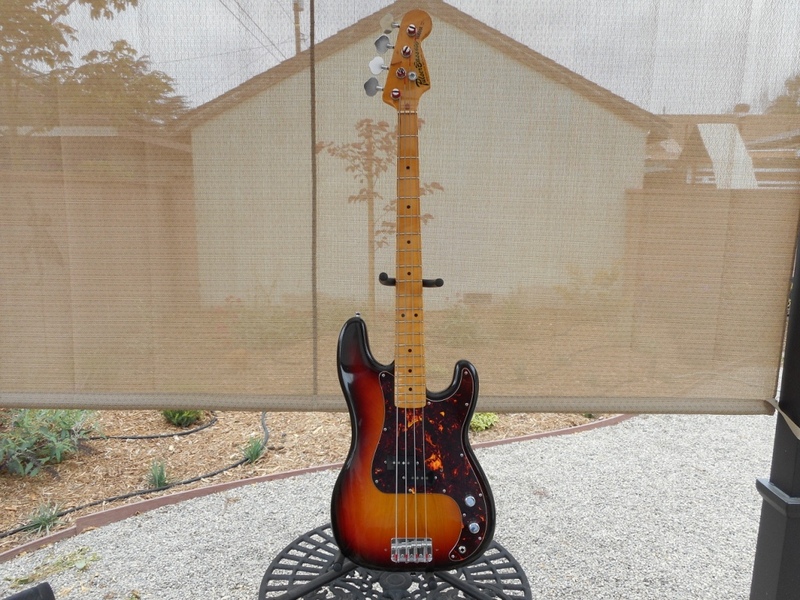 These basses have a street price of $599.99 with no case (list $799.99), but I see them on closeout fairly often, and used ones do not seem to hold their value terribly well, so you might be better off watching Craigslist and eBay for a deal, as they come up pretty often. Check one out for yourself and see it is your cup of tea – you might be surprised. 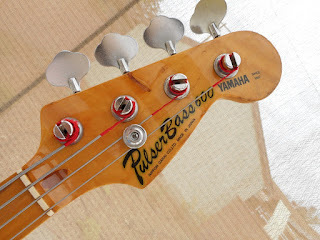 By now you may know that I have a deep fondness for eccentric Japanese guitars and basses, and today we are looking at yet another lawsuit-era bass: a 1980 Yamaha Pulser Bass 600, a faithful and unabashed copy of a 1970s era Fender Precision Bass. 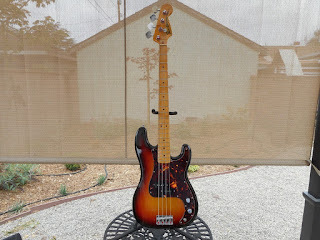 This bass is in great shape and seems to have been spared the indignity of ill-advised and unnecessary modifications over the years, which is a real bonus for me. Things are only original once, you know. This one has a contoured P body and it is hard to tell from the grain, but it is probably Sen, an ash-like wood from Asia. It was sprayed with a stunning 3-tone sunburst with a subtle red in it, and a 3-ply faux tortoise shell guard is installed. 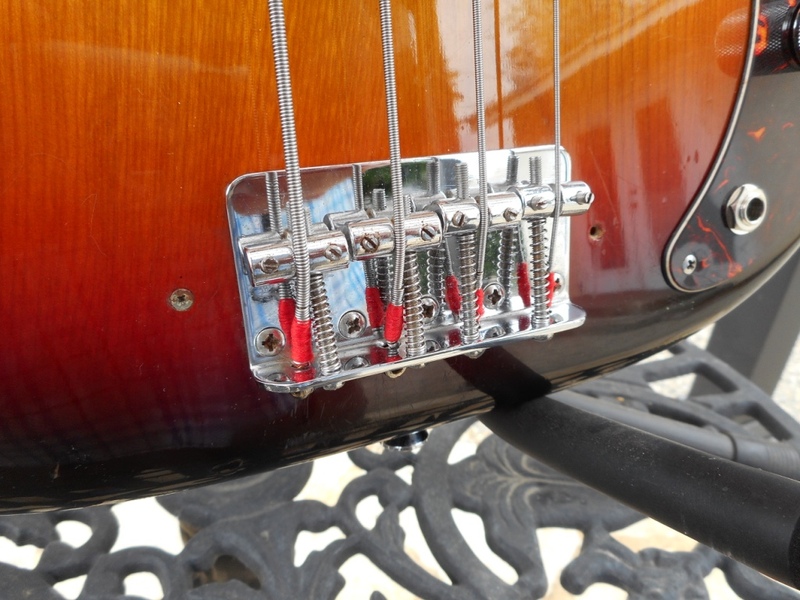 There was a thumb rest and a couple of pickup / bridge covers installed at one point, but they are long gone. This Yamaha’s 4-bolt maple neck has a nice thick layer of poly on it, and it is still in excellent shape, front and back. 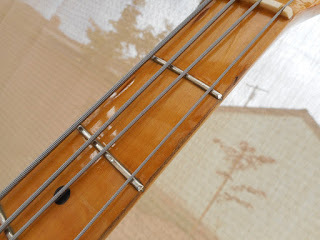 The 20 (king of fat) fat frets are still in great shape, with a little bit of wear. It has the typical 1 5/8” P width nut (plastic), but the neck is not overly chunky. I would call it a medium profile C shape. The truss rod adjusts at the heel, and it still turns easily. The hardware is very good for a middle of the price range instrument. The non-reverse machine heads are 4-screw open-gear pieces that look like Fender tuners, and the bridge is a pretty thick copy of a 5-screw Fender unit. The chrome is not flaking on any of these parts (or the knobs), which is unusual for Japanese instruments of this era. 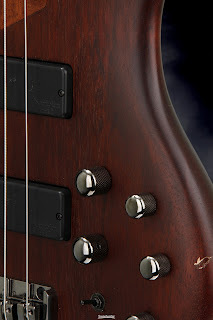 The pickup and electronics are original to the bass. There is not much to say about them except that they are exactly what you would expect – a split coil pickup with volume and tone pots. It sounds very good and beefy, with no untoward noises or humming. It is a good playing bass with no buzzing and a low action. 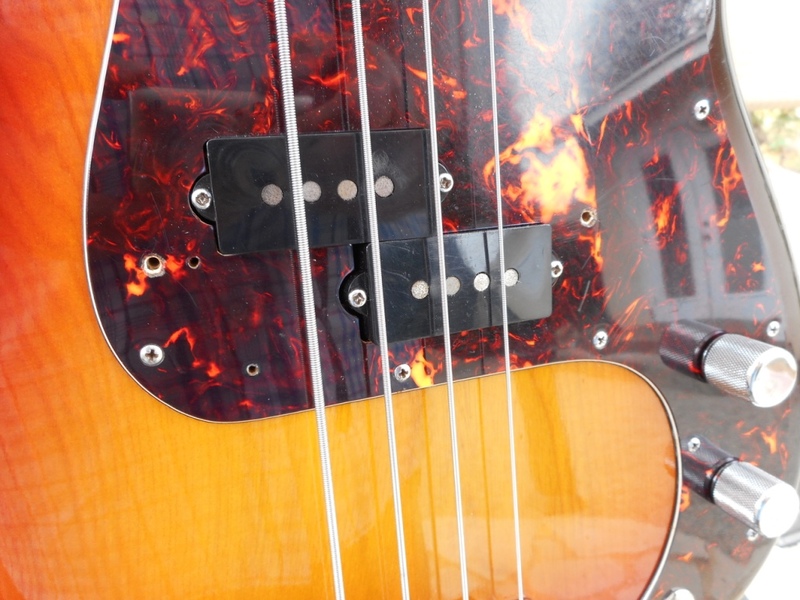 The pickup has strong output (hotter than its contemporary Fenders, and there is no buzzing or static. 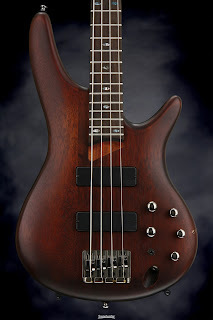 I play P basses with the controls dimed, and this one really makes my Genz Shuttle bark (in a good way). I like it a lot, so I might try to keep it around for a while. 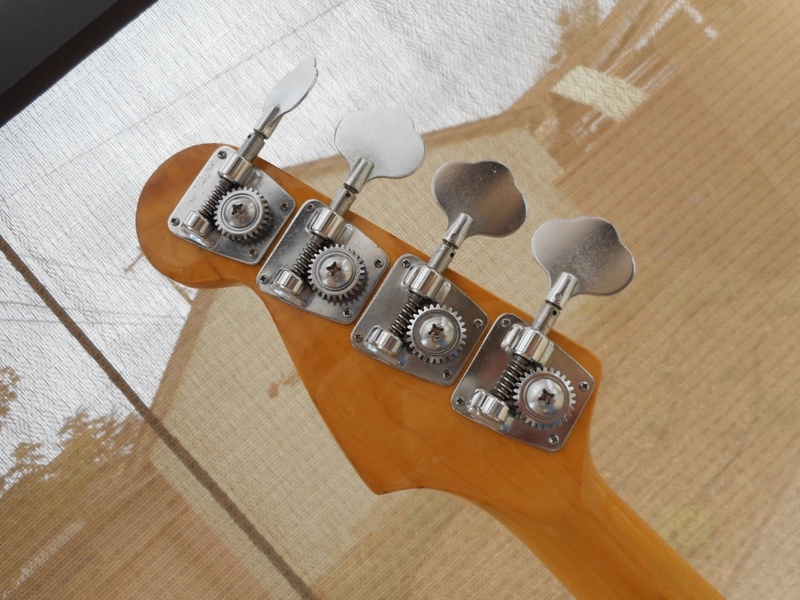 By the way, since this bass has the “600” designation, this is an indication of what the original price was, which in this case would be 60,000 Yen. This would have been around $271.50 in 1980 when this bass was built. 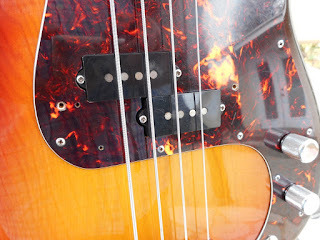 Hopefully this helps illustrate why these basses were such a threat to Fender – the Pulser Bass was a lot of instrument for the money at the time, and Fenders of that era were simply terrible. It is hard to place a value on the Yamaha Pulser Basses as there are very few of them in the states, and this is the first one I have ever seen in person (I bought it at a secondhand store in Japan). But, judging from a sample of one, they are reasonable priced and are fantastic instruments. If you get the chance to buy one, jump on it! It is hard for me to comprehend how pervasive the Internet is in my life until it is gone, and thanks to Frontier Communications, I got to experience this for nearly two weeks straight. I rarely go negative with my blog posts, but this is a cautionary tale for anybody who gets involved with this communications giant. For many years my family had used Verizon Fios for our Internet and television services (we do not have a land line), and during this period we only had a few brief service outages that were easily remedied by myself or their service technicians. Then, on April 1, 2016 Frontier Communications took over their service with virtually no warning. We received nothing in the mail and only a few e-mails that, quite frankly, looked like spam when they came in. But, through the grapevine, eventually we heard about it and the initial changeover was no big deal: our TV and Internet worked just fine. Then came Tuesday, April 26, when we completely lost our service and nothing worked at all. I got a call from my son while I was at work, and I gave him a few things to try but there was no joy. When I got home I fiddled around with the router and reset the wall box, and nothing changed. So, I got on the phone with customer service and waited. After a half hour I got in touch with a service agent who transferred me immediately to someone else who put me on hold. When they finally picked up, I tried to give this overseas operator my account number but they insisted on trying to figure out my account info from my phone number and address. This took a half hour. They had me try a few things (that I already did) then the call cut off. They did not call me back as they promised they would if the call got disconnected. This was 90 minutes of my life I will never get back. The next day I tried the online chat version of customer service, which took about 3 hours out of my day (using my cellular data plan, thank you), but the results were no better. They scheduled a service appointment six days later with an 8-hour window that I was supposed to be around. Nobody showed up at all on May 3 – no call, no e-mail. Nothing. On May 4, I called them back and got a surly agent in the US and I decided right then to cancel the service. She did not seemed surprised and told me they would send some boxes to mail their TV box and router back to them. No apologies, no empathy, and no surprises, really. I called Charter Communications, and they came out on Saturday May 7 to install the new service within a given one-hour window. The technician showed up early, so he tidied his truck and got the equipment and tools ready for the job. He spent three hours stringing a new line from the pole three houses down, and he was friendly, courteous and professional. He did a very tidy job and verified that everything worked properly before he left. This was a true joy after working with Frontier Communications. Interestingly, I got a phone call from a local Frontier technician while the new service was being installed, and he told me that he thought he could fix the problem remotely in 5 minutes. He was not aware that my service was cancelled, and he seemed apologetic about the troubles we had experienced. But this was too little, and far too late. Nearly two weeks without these services was a major pain, as all of our television comes through the internet in some manner. Also, I was in the middle of finishing my Masters thesis, which is possibly the worst time to lose my connection with the World Wide Web. So, we ended up running a hundred dollars in data overages on our cell plan, which we will never get back. And we were not alone: many of my friends experienced the same outages with Frontier, and there were many people on Nextdoor who reported that they were without service for almost a month, and they all experienced the same terrible customer service. You might think that is it, but yesterday I got another bill from Frontier, as apparently they still think I have service. Looks like I will have to get back on the phone again! 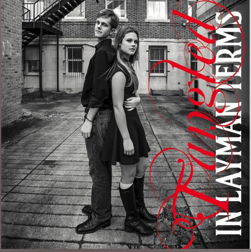 In Layman Terms’ debut album, Tangled, is a righteous collection of blues, funk, and rock, with grooving beats no matter where you look. The sister/brother duo of Logan and Cole Layman have been playing music together for their whole lives and are both amazing musicians who perform with the ease presence of hardened road veterans with decades under their belts. On this project, Logan handled the lead vocals and bass, and Cole played the guitar parts; joining them at Lowder Sound and Clay Garden Studios (both in Virginia) was a talented group of musicians that helped them achieve a lot of different moods and sounds. These folks included the producer, Ron Lowder Jr. on drums, and Brian Kloppenburg behind the keyboards. There are a few other folks that pitched in, as you will see later on. This album has nine tracks with seven originals, and only two covers: the Laymans wrote five of the originals, and Holly Montgomery penned the other two. The title track is the first song in their set, and they brought in a full horn that includes Ron Lowder Sr., Rick Thomasson, Mike Wholley, and Russ Robertson. “Tangled” has a huge blues and funk sound that starts things off on a strong note. The up-tempo funk is provided by Kloppenburg’s organ and Cole’s syncopated guitar rhythms, and Lowder Jr. is one hell of a drummer. Logan’s voice is a husky alto with a great range and emotion, and her phrasing and enunciation are both spot on. It would be hard to top this one, but as you will hear, the rest of the album is just as good. This is followed up by one of the standout tracks from the album, “Fake it ‘til I Make It,” a song Logan and Cole adopted from a poem their mother wrote about depression. I have seen this song performed as an acoustic duo, but this version is more of a soulful blues rocker with plenty of B3 from Kloppenburg. Logan nails the vocals and does a marvelous job with a walking bass line, and Cole tears off a killer extended guitar solo break. This could be one of their signature songs as it defines what the duo is all about. This song is a cool contrast to their fun and sassy rocker, ”Karma,” which has cool doubled guitar/vocal parts, and shows that there is a lot of range in what this band is capable of. The two covers are ambitious, and the Laymans pull them off with no problems at all. They take a run at Howlin’ Wolf’s “Smokestack Lightning,” which is cool to hear with a woman singing the lead. Logan does a righteous job of howling out the edgy lyrics, and Cole is a whiz at nailing the acoustic on this bare-bones track. Virginia Beach harpman Jack Campbell adds a super-distorted (yet tasteful) solo to hone the edge of an already intense song. The other re-do closes out the set, and it takes a lot of guts to walk in Janis Joplin’s shoes, but Logan rises to the occasion and proceeds to make “Move Over” her own. The doubled vocal/guitar intro reveals an almost psychic bond between a sister and brother, and sets the tone for a real barnburner of a tune. 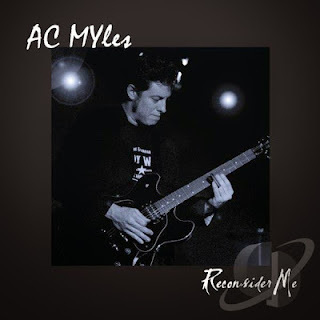 Cole’s guitar swaps smoking solos with Lowder Sr.’s tenor sax, providing a strong finish to a solid album. As I wrote earlier, Logan and Cole sound like they have decades of experience on stage, but that was intentionally misleading as I think their music stands on its own with no caveats about who they are. You see, this duo is still in their teenage years, but Tangled would be an awesome production no matter how old the artists are. But they are not just a studio phenomenon, and I recommend that you head over to their website to check out their videos and gig schedule, as they are a killer live act too! As a guitarist, sometimes there is need for a little extra oomph when soloing or reaching a dramatic passage in a song, so a boost pedal or volume pedal can be a wise choice. But these things usually take up quite a bit of valuable real estate on the pedalboard. 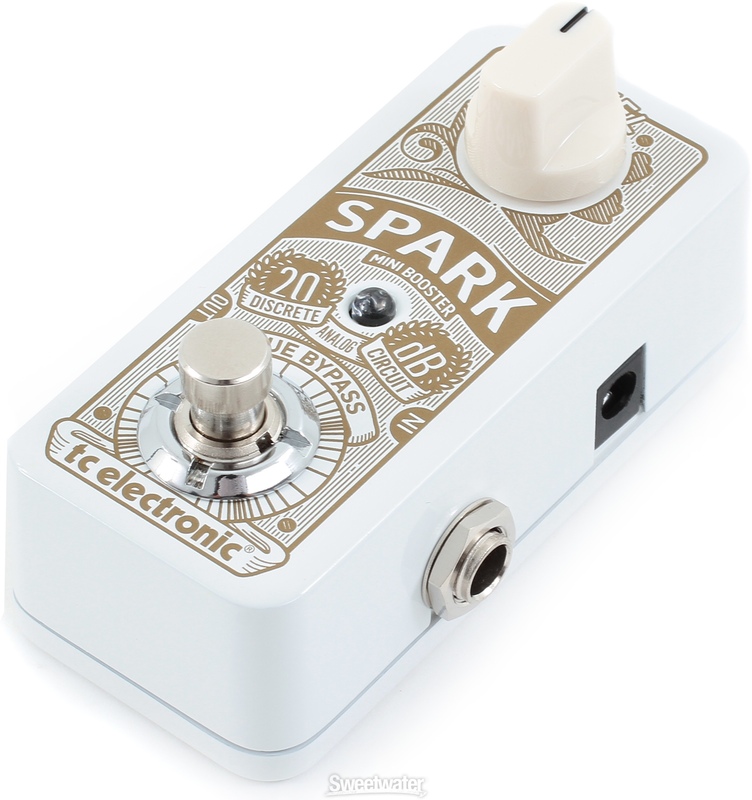 This is where the tc electronic Spark Mini Boost pedal comes in handy. 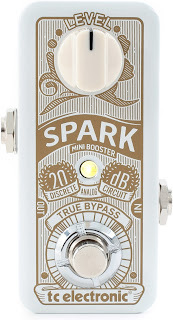 Mini, as in 2 ¼ by 2 ½ by four inches, or about half the size of a normal effect pedal. 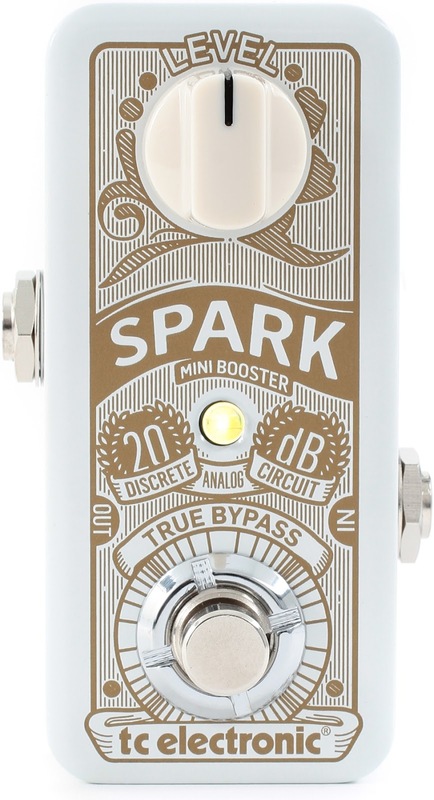 The Spark Mini Boost is a simple piece of equipment, with a Level knob, footswitch, and LED on top, single input and output jacks on either side, and a socket for an AC adapter in case you do not want to use a 9-volt battery (the power supply is not included). 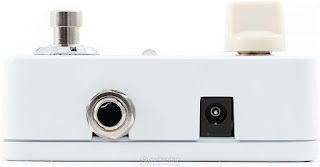 The footswitch uses tc electronic PrimeTime feature, where a quick tap of the switch will turn the boost ON or OFF, or if you hold the switch down a little longer it will only stay ON for as long as it is pressed. This feature is pure gold! This pedal will boost the signal from your guitar up to 20dB, and depending on where it is in your signal chain, you can use it to provide extra volume or extra volume. For more volume position it before your drive pedal(s), and for more gain place it at the end of the signal chain. I think the tc electronic Spark Mini Boost pedal is a winner as it has a clean sound and does what it is supposed to do; I like having it in my signal chain. It is not terribly expensive either, coming in at around $50 on sale (list price is $137, and normal stet price is $80). Try one out and see what you think, it might be just what you are looking for.